And once your organization starts to digitally transform, it will never be the same. Your organization may be feeling some pressure to investigate and undergo a digital transformation project. Your competition is embracing it, but you are not sure what digital transformation is or what its impacts will be. How do you get there? And who's in charge? Things can quickly become overwhelming, and digital transformation can start to seem like more than IT or a business unit can successfully deploy. Early in my career, I worked on projects that involved converting manual processes into automated processes. We converted overnight processing into real-time transaction processing. This transformation allowed my clients to offer new kinds of services, learn more about their business, increase efficiencies, reduce time delays, gain insight into their customers, and even detect fraud. Similar capabilities will be delivered by today's digital transformation initiatives. Digital transformation is the transformation of a business unit's and/or organization's processes, procedures, activities, competencies, and business models. The transformation leverages the opportunities of a mixture of digital technologies. It accelerates the impact across businesses and organizations in a strategic and prioritized way that builds and sustains a competitive advantage. Computers, software, and networks are the tools that can accomplish digital transformation if properly applied. 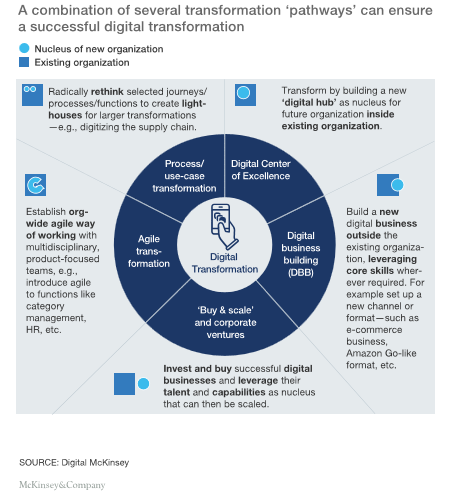 A McKinsey Quarterly article, "The Case for Digital Transformation," states that on average, "industries are less than 40% digitized, despite the relatively deep penetration of these technologies in media, retail, and high tech." You do not want to look back and discover you should have started earlier. You may be creating a crisis which you have not yet discovered. A great quote from Stanford economist Paul Romer is, "A crisis is a terrible thing to waste." Unfortunately, a crisis may be the only way you can convince your organization to rapidly embrace digital transformation. Digital transformation is a change in business and a change in mind set. Think of it as a business turnaround. It doesn't matter whether you are a non-profit, government, business, or any other type of organization. Digital transformation will require imagination. How you did business in the past will not be the best way to do business in the future. The traditional IT organization with projects that may last months or years is inadequate for digital transformation success. If you have not already created this position, a Chief Digital Officer will go a long way toward delivering success. That person should have the authority across existing internal organizational silos (see, "Into the Future with Chief Digital Officers"). There appears to be no single path to follow for digital transformation success. The pathways will depend on where you are coming from and where you want to go. It will also depend on what the competition is doing and how you can combat that competition. The diagram below is from McKinsey & Company's "Turnaround Artists: How Companies can Catch Up to the Digital Revolution." One of the points of this diagram is that the creators envisioned not only the existing organizational structure but new structures. You need to make changes rapidly. Taking small steps over a long time does not turn around your business quickly enough. What you are doing is disruptive. Expect that your revenues and profit may suffer. It may be chaotic during the transformation. Digital transformation is not the same as adding new applications and infrastructure. Those in charge will require specific skills and specialized talent. The CDO should not be invested in how the business is presently run. The CDO should know about information technologies and understand that the goal of transformation is to generate revenue and profit and retain or increase market share. He or she should be a business person with the technology capability, not the reverse. Investing in digital technologies is not enough. You may have to invest in other parts of the business such as legal, sales, marketing, inventory, and production. You will be affecting your staff and management, as well as your vendors and suppliers. Break up the transformation into smaller, more manageable units. Use project management tools that are transparent to all those with a stake in the success. Good management tools offer decision-makers progress knowledge. They can learn quickly what is failing and determine what dependencies need to be addressed and then make the correct allocations of resources. The transformation team will include the CDO; one or more senior business-oriented people; and data center, applications, network, and endpoint experts. This group of individuals will be experimenting with new ideas. Expect some of those ideas to fail. Changing the budget to eliminate the failed efforts may occur frequently. There will be internal resistance. Change equals risk -- risk to careers, risk to budgets, and risk to the organizational structure. You will change the way your business operates with customers. Your internal staff needs to change as well, so pay attention to your staff because resistant staff can create a failed transformation. Successful delivery of digital transformation may allow your organization to return to its old routines and mind set. The digital transformation may no longer be as competitive as it was when initially established. Transformation will alter the economics of your organization differently, depending on your industry. Some transformation elements may be restricted by regulation and compliance issues. Your version of transformation may not play well in different cultures. You need to keep the transformation mindset, otherwise you will lose your competitive position, have a crisis, and have to start all over again.